The same feature is updated in both the current version being edited and the target version. The same feature is updated in one version and deleted in the other. A topologically related feature or relationship class is modified in the current version being edited and a target version. If there are conflicts, ArcGIS resolves them in favor of either the edit version or the target version representation, depending on your preference. Once conflicts are resolved, you can review them one at a time and, if necessary, make any changes. For example, if a conflict is resolved in favor of the edit version, you can choose to replace it in favor of the target version or use the editing tools to modify it in another way. Determine which fields or rows are in conflict. Resolve conflicts by designating which representation to use to replace features or attributes. You can tell that none of the objects has been visited or replaced because the ratio of total reviewed conflicts to total conflicts is still 2/2 and 1/1 for each feature class. You can also tell none of the conflicts has been viewed or replaced because all ObjectIDs and feature classes are in bold. This list indicates that there is a total of three conflicts as a result of the reconciliation operation, and one of those three has been visited or replaced. The list also shows that 30 is the ObjectID of the conflicting feature that has been visited or replaced, and this feature is in the ponds feature class. 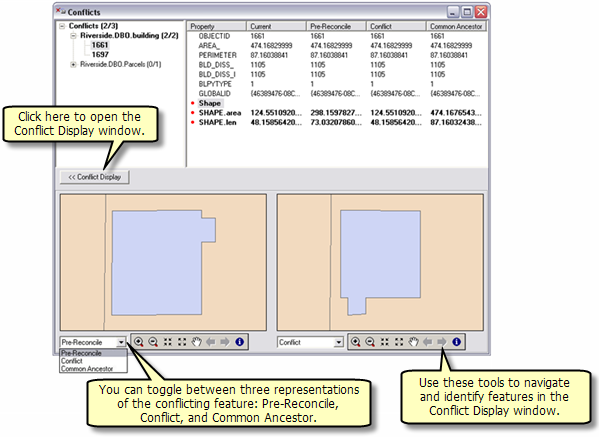 When you select an individual feature in the list, the columns and attributes in the prereconcile, conflict, and common ancestor versions of the feature appear in the list on the right of the Conflicts dialog box. The prereconcile version represents the feature and attribute edits that you made. The conflict version represents the feature and its attributes as edited and reconciled by another user. The common ancestor version is the representation of the feature and its attributes as they are in the database; this is what the feature and attributes were before any edits were made. A red dot to the left of the field name identifies a conflict. For example, if the feature's geometry was edited in each version, a red dot appears next to the Shape field. If other attribute fields are in conflict, a red dot appears next to them. If a feature has been deleted in either version, <deleted> appears for that version's attribute value. If features have been inserted into the Child version and they are promoted to a conflict, <Did not exist> appears in the Target and Common Ancestor versions. Two buttons at the bottom of the dialog allow you to toggle between seeing all of the fields or only seeing those fields which are in conflict. Having the attributes and values for all representations of a feature in conflict allows you to see how the attribute values differ and helps you choose which representation of the data to preserve. 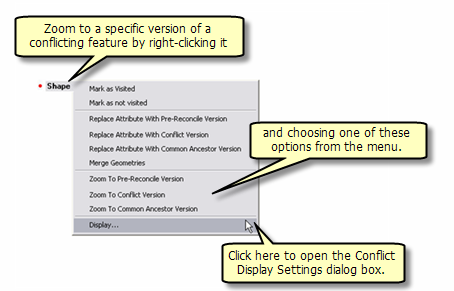 If you click the Conflict Display button on the dialog box, two representations—the prereconcile and conflict versions—of the conflicting features are displayed at the bottom of the dialog box. Using the pull-down lists beneath each representation, you can toggle through three different representations of the conflicting features: Pre-Reconcile, Conflict, and Common Ancestor. Note that these will only look different if the features' geometries are in conflict. Each representation has a toolbar below it that contains tools you can use to navigate to and identify the corresponding representation. You can zoom to a specific version of a conflicting feature on your map by right-clicking it in the list and clicking either Zoom To Pre-Reconcile Version, Zoom To Conflict Version, or Zoom To Common Ancestor Version. If there are geometry conflicts, you can also see different representations on the map by right-clicking the Shape field in the list box and clicking Display. 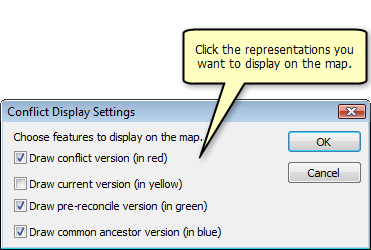 This opens the Conflict Display Settings dialog box. Click the representation you want drawn on the map. The conflict (target) version's representation is displayed in red. The prereconcile representation is displayed as green. The common ancestor version's representation is displayed in blue. After you have viewed the conflicts, you can mark them as visited or choose a replacement option to resolve the conflict. As mentioned in the "Determining which fields or rows are in conflict" section, you can mark a feature as visited. This indicates that you have reviewed the conflict but do not want to choose a replacement option at this time. You can keep track of which features in the list you have reviewed because those marked as visited are no longer shown in bold. If you decide you want to come back to a feature conflict later, you can right-click the ObjectID in the Conflicts list and click Mark as not visited. This causes the feature to be shown in bold again. When you resolve conflicts, you are deciding which representation of the features and attributes you want to keep. Regardless of what version you opted to reconcile in favor of—the target or your edited version—you can specify which representation to keep: either the prereconcile representation (how it appeared in your version prior to reconciliation), conflict representation (how it appears in changes made by another editor), or common ancestor representation (how the feature or attribute is in the target version). This occurs at the field level. If there are conflicts in attributes, you can replace just the attribute value in the current version with one from either the prereconcile, conflict, or common ancestor representation. To do this, right-click the attribute in conflict and click the option you want from the menu. This occurs at the row level. You can replace an entire feature with the representation of the feature in the prereconcile, conflict, or common ancestor version. This means any fields in conflict will be replaced. You can choose to replace the current representation of the entire feature class with either the prereconcile, conflict, or common ancestor version representation to resolve the conflict. This replaces all the conflicting features and attributes at once, allowing you to quickly update and replace conflicting features. If there are multiple features in the Conflicts list, all of them are replaced with the version you choose. To choose a class-level replacement option, right-click the feature class name in the Conflicts list and click whichever version you want to use. This is root-level replacement. Using this replacement option replaces all conflicting features and feature classes in the list with the representation designated. If you have multiple feature classes and multiple objects in conflict, all of them are replaced with the version of your choosing. Right-click the feature class name in the Conflicts list and click the version you want to replace all conflicts. This occurs at the field level and is associated specifically with the Shape attribute. 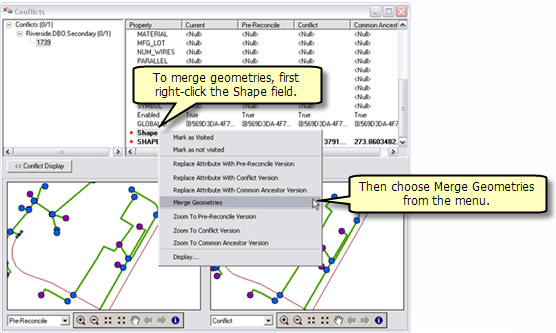 The option to merge geometries is available when there is a conflict concerning the Shape field. 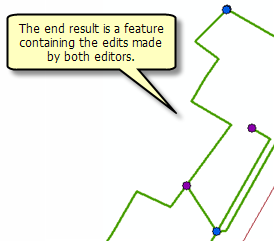 If two editors both edit the geometry of the same feature but do not edit the same area of that feature, they have the option to resolve the conflict by merging geometries and accepting both edits. The option to merge geometries is only available on the Shape field shortcut menu. "Error found while merging geometries. Cannot merge the two geometries. The edited regions overlap." When you edit network features, changes to the geometric network and to the logical network may create conflicts. For example, when you add a service to a main, the main will not be physically split in the geometric network but will be split in the logical network. Therefore, while you have not directly edited the main's geometry, it has been edited logically. If the target version you are reconciling has also modified the main, the new service you inserted will create a conflict with the main. Reviewing a conflict involving geometric network feature classes requires understanding how the Replace With command on the Conflicts dialog box updates the existing network topology present in the edit session. In the service main example, two users modified the water main—one by changing an attribute and the other by connecting a new service. Reviewing the conflict merely requires investigating the differences and seeing that the conflict is valid, and no further action is required. Since the main contains the correct attribute for the diameter, the new service is correctly connected to the main. But there are cases when resolving conflicts involving a junction feature class also updates the connected network edge. Working with feature-linked annotation requires that you remember one rule: when replacing a feature that has feature-linked annotation, both the feature and the annotation are replaced with the new feature and annotation. Therefore, you might have to further edit the new annotation to avoid ending up with two annotations. For example, you could encounter a conflict in which you have moved a feature and repositioned its annotation. The conflict version has performed the same edit, moving the feature and rotating the annotation. If you decide to replace the feature with the conflict version's feature, the existing feature-linked annotation is deleted, the conflict feature is inserted, and a new annotation is created. You will then need to edit the new annotation by moving and rotating it as necessary. Or you might encounter a conflict in which another editor has deleted a feature in the DEFAULT version of the geodatabase, which also deletes its associated feature-linked annotation. In a child version of the geodatabase, you edit the annotation that was just deleted. When you reconcile, if you decide to replace the feature with the edit version, the feature that had been deleted in the DEFAULT version and its associated linked annotation will be replaced, and you will get the annotation from your edit session, thereby leaving you with two annotations for the same feature. Relationships have dependencies similar to feature-linked annotation. Deleting a feature from an origin relationship class may trigger a message to delete a feature from the destination relationship class. Therefore, be aware of the ramifications of simply replacing conflicts involving feature classes that participate in relationship classes. You update the Origin Class Primary field, breaking the relationship in version A. At the same time, you update the destination class-related feature in version B. Since the destination class is dependent on the origin class, a conflict is detected when you reconcile the versions. In your electric utilities feature dataset, you delete a pole that has a relationship to a transformer, causing the related transformer to also be deleted. In another edit session occurring at the same time, an editor alters the attributes of the transformer you had just caused to be deleted by deleting its related pole. When the edits are reconciled, an update-delete conflict will be detected. In this last example, if the second editor chose to replace all conflicts with the edit session representations, the pole and transformer deleted during your edit session will be re-created, and the transformer from the second editor's session will be created, thus leaving you with two transformers. You may not be able to detect this looking at the map, because the transformers will be one on top of the other; however, there will be two records for the transformer in the attribute table. Because features in feature classes that participate in a topology can share geometry with other features, the process of reviewing conflicts between versions of topological feature classes is different than replacing conflicts with simple feature classes. It is also different than the process used to replace conflicts with geometric networks, relationship classes, and feature-linked annotation. When a feature class that participates in a topology is edited, other topologically related features may be simultaneously changed. The changed features may belong to the same feature class or to one or more other feature classes. To manage the process of detecting new topology errors that have been introduced by edits, topologies record where edits have been made as dirty areas. Editing features in a topology creates dirty areas in the topology. New topology errors may occur when edited parent and child versions are reconciled, even when the dirty areas within each version have been validated and are free of errors. To detect such topology errors, the dirty areas in a child version are all returned to dirty status after changes from the parent version are brought into it during reconciliation. After reconciliation, these areas can be revalidated, and any errors will be detected. Any dirty area the child version inherited from the parent version, whether it is validated in the child version or not, will be a dirty area after reconciliation. Any dirty area that was created for any feature that was created, updated, or deleted in the child version, whether it is validated or not, will be a dirty area after reconciliation. Editing a feature class that participates in a network dataset may change connectivity—that is, how network elements connect to one another. (Network elements can represent streets, overpasses, and so on.) Furthermore, multiple feature classes can participate in a network dataset, so editing one source feature class can change the connectivity of network elements generated from other source feature classes. Because multiple feature classes can participate in a network dataset and connectivity is based in part on geometric relationships, the process of reviewing conflicts in network datasets is very similar to that of topologies. A clear indicator of this is that network datasets also use dirty areas, but they are used to manage the process of detecting connectivity changes rather than topology errors. A field conflict filter provides the ability to tag a field or set of fields within feature classes as being filtered from conflict detection. This is only applicable when the option to define conflicts By Attribute is selected. When a field has a conflict filter defined for it; the field value following reconcile will be based on whether reconcile was performed in Favor of the Target or in Favor of the Edit. If reconcile is performed in Favor of the Target; fields with a conflict filter will have the value from the Target version. If reconcile is performed in Favor of the Edit; fields with a conflict filter will have the value from the Edit version. The Add Field Conflict Filter tool can be used to define the set of fields to filter from conflicts. The Remove Field Conflict Filter tool can remove these conflict filter from these fields. The ListFieldConflictFilters GP function can be used to identify when a feature class or table have conflict filters defined. Once a Field Conflict Filter is defined for a feature class or table; ArcGIS clients prior to 10.2.1 will be prevented from opening the feature class or table. 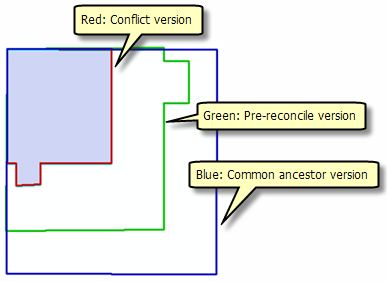 Field Conflict Filters can be defined on a field and then removed after versions have been reconciled if previous releases of ArcGIS need to access the data.